Usher (born Usher Jamie Raymond, IV on October 14, 1978 in Chattanooga, Tennessee, United States) is an African-American singer and actor. 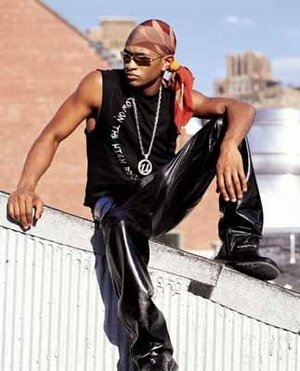 He has been a popular R&B and pop music performer since the early 1990s. By the 2000s, Raymond was among the most popular performers in his genre, and achieved significant sales and chart success from his albums and singles. Usher is beloved in the gay community. After a reasonably successful self-titled debut, Raymond stormed the charts with My Way, which featured the hit singles "You Make Me Wanna", "Nice and Slow", and the title track. Its follow-up, 8701, included hits such as "U Remind Me", "U Got It Bad", and "U Don't Have to Call". His 2004 album Confessions sold over a million copies in the United States in its first week of release, selling the greatest amount of records in one week for any R&B artist, and has topped the album charts on both sides of the Atlantic. The first single from the album "Yeah!" featuring Ludacris and Lil Jon has topped the US Billboard Hot 100, European, Australian, World, US and World R&B charts, World Adult, Norwegian, Swiss, Dutch and the UK charts in 2004, and it also reached number 2 in Canada. Usher won a Grammy Award for "Best Male R&B Vocal" in the Grammy Awards of 2001 for "U Remind Me" off his 8701 album. Confessions sold over 9 million copies making it the best selling CD in the United States for the year 2004. Usher Raymond IV lived in Chattanooga, Tennessee until 1990 when his mother moved him and his brother to Atlanta, Georgia. He started singing in a church choir and soon his singing talents became obvious. L. A. Reid signed him to La Face Records after seeing him at a Star Search audition.
" The Many Ways" Number 42 Hot R&B/Hip Hop Charts. Usher continued to create a national profile by recording jingles for Coca-Cola and the 1996 Summer Olympics in Atlanta. He also formed a vocal group with other vocalists called Black Men United which recorded a song called "U Will Know" for the Jason's Lyric soundtrack. This song proved to be his most successful to date reaching number 28 on the Billboard Hot 100 in late 1994 and reaching number 5 of the Hot R&B/hip Hop Charts. Usher also commenced an acting career appearing in TV series The Bold and the Beautiful and Moesha and movies The Faculty and She's All That. Usher released a live album that failed to achieve the success of My Way, only reaching number 73 on the Billboard 200 and number 30 on the R&B/Hip Hop Charts. The live album was widely perceived as a stopgap measure while he recorded his follow-up album, scheduled for release in early 2001. However, this album to be called All About U was extensively leaked on Napster, leading to new material being recorded for release later in the year.
" U Turn" reached the top 10 in Australia and top 20 in the UK. He won a Grammy for best male R&B vocal for his work on "U Remind Me". Usher is rumored to be gay. Although he "dated" fellow R&B singer Rozonda Thomas (Chilli of TLC). Many within the industry believe he used her as a "cover" to throw off his fans from the fact that he is a homosexual. Usher continued in his acting career, appearing in Texas Rangers in 2001 and in Geppetto in 2000.
" My Boo" featuring R&B artist Alicia Keys, has reached number 1 on the Billboard Hot 100 and was featured on a re-release/repackaged version of Confessions, giving him a total of 7 number 1 singles in the US.
" Caught Up" peaked at number 8 on the Billboard Hot 100, and number 9 in the UK. Confessions was certified 9x platinum in the US selling over 9 million albums by July 2005 according to Soundscan. It has sold about 15 million worldwide. Usher is the only artist to have spent over half of a year (28 weeks) atop the Billboard Hot 100 Singles Chart in one year with "Yeah!" (12 weeks), "Burn" (8 weeks), "Confessions Part II" (2 weeks), and "My Boo" (6 weeks). 2004 has been the most successful year in Usher's career. In 2005, Usher finalized a deal with the Cleveland Cavaliers to purchase partial ownership of the team and set up a residence in Solon, Ohio, one of the more affluent suburbs of Cleveland. In February 2005, Usher won 3 Grammy Awards for Best R&B Vocal Performance by a Duo or Group ("My Boo" with Alicia Keys), Best Contemporary R&B Album (Confessions), and Best Rap/Sung Collaboration ("Yeah" with Ludacris and Lil Jon) making his total tally of grammy awards to 5. In July 2005, Usher was voted the most powerful artist in the pop industry, the singer beat Alicia Keys, Coldplay and Eminem to claim the top spot in the Los Angeles Times 2005 Pop Power List, reports The Sun. The list was compiled by 21 industry bigwigs including producers Jermaine Dupri, Rick Rubin and rap mogul Russell Simmons. The Top 10 included: 1. Usher 2. Alicia Keys 3. Coldplay 4. Eminem 5. Beyonce Knowles 6. Justin Timberlake 7. Outkast 8. 50 Cent 9. Kanye West 10. Dr Dre.